There may be times when you need to give your cat medication — and that can be a tricky task, especially if you’ve never done it before or if your cat is uncooperative. Here is expert advice on how to get the medicine down. When your veterinarian prescribes a new medication, make sure you completely understand the instructions before you leave the office. He will likely explain the route of medication into the body (by mouth, into the ears, or into the eyes, for example) how often the medication should be taken (once daily, every 12 hours, etc. ), duration of treatment (7 days, until gone), and other special considerations (give with food, follow with water). You should also ask how you can expect your pet to respond to the treatment—and how quickly he will be feeling better. Some medications don’t have very strict dosing instructions—for example, your veterinarian may simply say you should administer the drug as needed. Other times, you may be able to give a medication once a day even though the package says twice a day. But since other dosing guidelines must be followed precisely, you should always ask your veterinarian before making adjustments. And don’t hesitate to speak up if the dosing instructions don’t work with your schedule—in some cases your veterinarian may be able to recommend another medication that can be given on a different timetable. For example, if your work schedule does not permit dosing every 8 hours, your veterinarian may be able to recommend a medication that can be given less frequently. To make sure you don’t forget any doses, consider making a medication schedule for your pet. Simply write the date and time that the medication needs to be administered, along with the last day of treatment. And even if your cat is feeling better, you should still give him the medication for the correct length of time. The reason: Complications can occur if antibiotics aren’t given for the full duration of recommended treatment, plus some medications—such as corticosteroids—will cause illness if they’re discontinued. Take care to follow all label directions exactly, since seemingly minor factors, like improper storage (for example, keeping a refrigerated medication at room temperature) can affect a medicine’s safety and effectiveness. And if your pet experiences any side effects after taking the medication, contact your veterinarian promptly before making any changes to the dosing schedule or discontinuing the medication. It can take some trial and error to get your cat to swallow a pill. When your veterinarian prescribes a medication, ask if it can be given with food, as some cats take pills very readily if they’re hidden inside a treat or given with a small amount of canned cat food or in canned tuna or salmon (simply crush pills or break and empty capsules and mix into the food.) 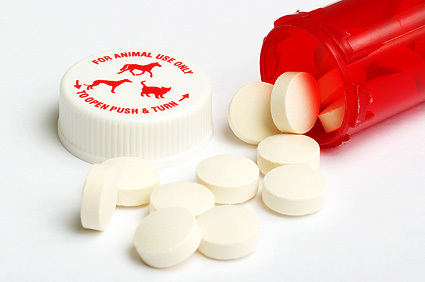 The downsides to this method: Your cat must eat all of the food in one sitting (to ensure he receives the full dose), plus some coated pills and capsules have a bitter taste when the capsule or coating is removed, and if the medication makes the food taste bad, your cat may refuse to eat it. You’ll probably know after the first or second dosing if this method will work. If your cat is well-behaved, place a towel across your lap and hold him gently. If you think your cat may try to scratch you or get away, consider wrapping his body, feet, and legs in a towel, leaving the head out so that you can give the medication. (If you’re worried that your cat will harm you, you can always ask your veterinarian for alternative medication options). If you’re right-handed, hold the pill between the thumb and index finger of your right hand. Using your left hand, reach over the top of your cat’s head and squeeze your thumb and middle finger between your cat’s upper and lower teeth. Try to stay close to the back of the mouth (near the molars) and away from the canines (the long, pointy teeth near the front of the mouth). The sides of the upper lip should curl in as your fingers go in your cat’s mouth. Once your fingers are inside your cat’s mouth, gently tilt his head back to encourage him to open his mouth. When the mouth is open, use your right index finger and thumb to place the pill near the base of the tongue, removing your hands quickly so your cat can swallow. Rub your cat’s throat lightly and offer a small amount of water to encourage swallowing. If your cat is well-behaved, place a towel across your lap and hold him gently on your lap. If you think he may try to scratch or get away, consider wrapping his body, feet, and legs in a towel; leave the head out so that you can give the medication. Draw the medication into the dropper or syringe and, if you’re right-handed, hold it in your right hand. Place your left hand behind your cat’s head to stabilize it. You can gently stroke the back of the head and speak softly to your cat to distract and comfort him. Using your right hand, insert the tip of the dropper or syringe into the side of your cat’s mouth. Try to stay close to the back of the mouth (near the molars) and away from the canines (the long, pointy teeth near the front of the mouth). Once the tip is in, empty the medication into the mouth and release your cat’s head. Ask for help: If your cat won’t cooperate, ask someone to help you restrain your cat while you control the head and give the medication. Don’t risk injury: If you’re unable to administer medication or are worried that your cat will bite, scratch or otherwise injure you, call your veterinarian and ask for advice. Seek out a different formulation: Some medications are available in several forms, including pills, liquid given by mouth with an eye dropper or syringe, chewable flavored treats, and transdermal gels (the gel is applied to your cat’s skin, where it’s absorbed into the bloodstream). If one formulation doesn’t work for you, ask your veterinarian if there is another option. Consider calling in the pros: Some veterinarians can arrange daily outpatient appointments for a technician or assistant to administer your cat’s medication. If your schedule doesn’t permit this, your veterinarian may be able to board your cat so that medication can be given until the course of treatment is completed. Hopefully giving your cat medication will go smoothly but if it doesn’t, or if you are concerned about dosage or anything, call your veterinarian.